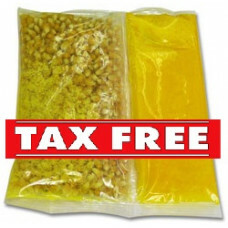 The HTD Canada Popcorn Company authentic theater 8 oz portion packs are for our 8, 12, 14, 16 or 20 oz poppers. You will get a box of 24, 8 oz portion packs. Our blend is the same as found in national theater chains, so if you want real theater popcorn at home, you found it. These handy popcorn portion packs have the following features: No measuring, No mess, No clean-up. Pre-measured amounts of popcorn, seasoning salt, butter and coconut oil for perfect popcorn every time.